New technology means design is being used as a tool to connect us in a way that no medium can. Both visually and through sensorial distortion, new devices are able to temporarily modify our perception of the world, inhibiting our senses and simulating unfamiliar experiences. Virtual reality technologies have often been associated with the gaming world and used primarily for entertainment. The idea of spending more time immersed in the digital world originally seemed as though it might lead us to become self-obsessed zombies with no ability to communicate with each other. We are, however, beginning to see a shift away from recreational usage towards something that could potentially connect individuals from different walks of life in a more profound and intimate way than any other form of media. 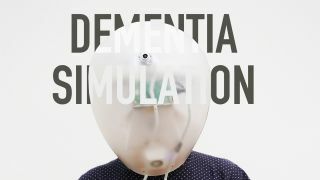 The Dementia Simulator, designed by Central Saint Martins industrial design MA graduate Di Peng, simulates the symptoms of dementia by disrupting users’ sensory perceptions. The device, which sits over the head, distorts the wearer’s vision by blurring the faces of those nearby. Critical comments and uncomfortable sounds are played into the wearer’s ears, mimicking auditory hallucinations, while a mouthpiece also restricts the wearer’s ability to speak certain words. By replicating the experiences of dementia sufferers, the simulator aims to create empathy, re-evaluate misconceptions, and ultimately help people to understand and care for those living with the condition. Royal College of Art design products MA graduate Heeju Kim has created the Empathy Bridge for Autism, which allows wearers to experience first-hand what it’s like for people with autism to see, hear and speak. Kim has designed a series of devices that temporarily change sensory perception. Tools affecting vision, hearing and speech enable the wearer to experience different aspects of living with autism. For example, hypersensitivity to light and colour, double vision, jumbled or amplified sound and difficulties in pronunciation are simulated using the VR device, an earpiece, and a variety of differently shaped lollipops and candies. The product’s message is clear: empathy is the bridge to understanding that people with autism are like everyone else, although they see, hear and speak in unique ways. Finally, the National Autistic Society’s Too Much Information campaign, which similarly helps increase understanding of autism, features a VR experience that enables viewers to see the world through the eyes of a 10-year-old autistic boy. The campaign highlights the ways in which autistic people often struggle to filter out sounds, smells and sights, leading them to feel overwhelmed by too much information. This article was originally published in Computer Arts magazine issue 263. Buy it here.